Bluewater Technologies Group has opened its sixth facility. In order to accommodate the continued growth and forecast of new employees required to support increased demand, Bluewater has moved part of its audiovisual integration operations to a newly renovated 26,000-square-foot space in Farmington Hills, MI. “Our rapid growth drove our need to find more office and warehouse space," said Tobi Tungl, vice president of operations. “The additional space allows us to address our growth needs and maintain the essential elements that are most important to our team." 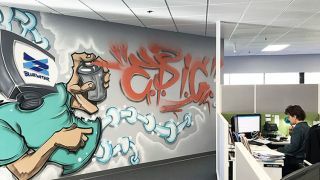 This site features an open floor plan, huddle rooms, and unique personal spaces, and an environment the company believes is reflective of its culture and personality—with appointments including interpretive graffiti by local Detroit artist Antonio “Shades” Agee—and will provide a destination where employees will enjoy coming to work every day.